After months of build-up, the UK’s referendum on its EU membership will take place tomorrow. As a result, fears of trade slowdowns with continental Europe, a weakening GBP, and stress on UK businesses have many investors looking for ways to diversify their investments. In our recent In Search of the Brexit Hedge, we saw how UK revenue exposure affects the UK equity markets and potential hedge opportunities within the space, but there may be other options for playing it safe as the vote approaches. 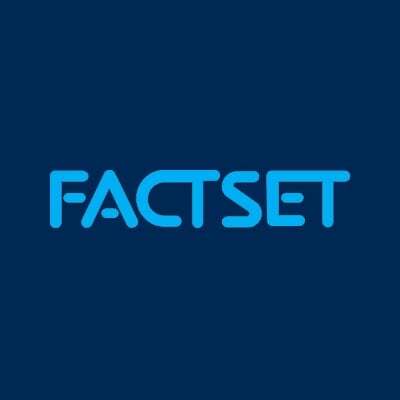 Traditional finance tells us that an easy form of diversification for equity exposure exists in the fixed income market. With this in mind, we’ll use a simplistic analysis by testing traditional balanced portfolios to determine where the best flights to safety may exist. 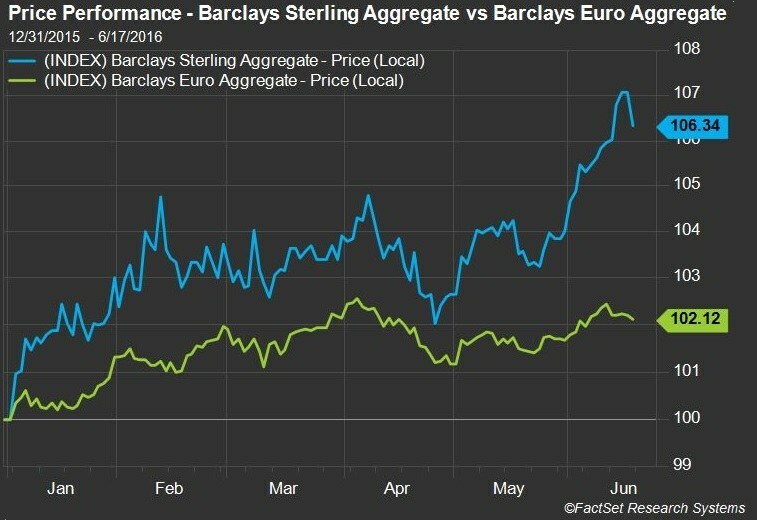 The Barclays Sterling Aggregate has had a huge run since the beginning of June , whereas the Barclays Euro Aggregate has had more modest performance. Though so far this year, investors would have seen a lower local return from the Euro bond market, the UK bond market shows far more volatility. With current market unrest in Europe, investors may not be able to afford the additional risk. Even in the event we rely on the bond market for diversification, we need to look at geographic susceptibility within that universe should Brexit become a reality. We start by examining the geographic makeup of the indices. A geographic breakdown by domicile shows almost 85% exposure to UK for the Sterling Aggregate, with small exposures (less than 3.5%) to the US, Germany, and France. A similar view for the Euro Aggregate shows very little, if any, exposure to the UK. Rather, this index has large exposures to France (22.2%), Germany (18.3 %), and Italy (16 %), and moderate exposures to Spain and the Netherlands. Though the global breakdown of the two indices by country is quite different, given that the UK is a huge trading partner for the rest of the European Union, we still expect issuers in the rest of the region to have some exposure to the UK. 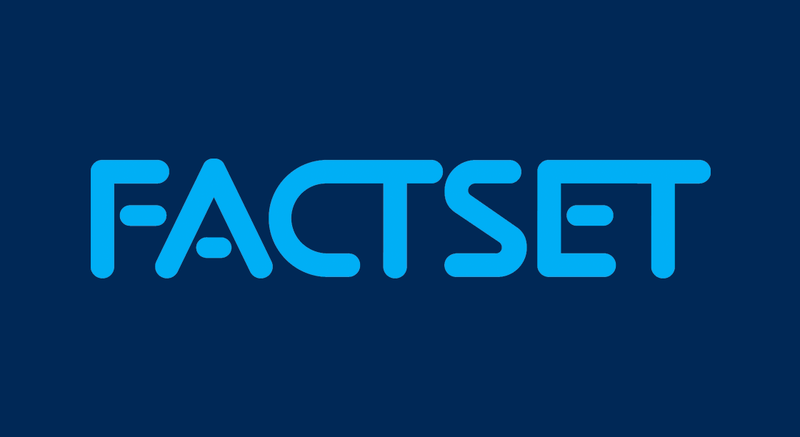 We can quantify that level of exposure by breaking UK revenue exposure into categories representing varying degrees of UK exposure, 0-20%, 20-40%, etc. 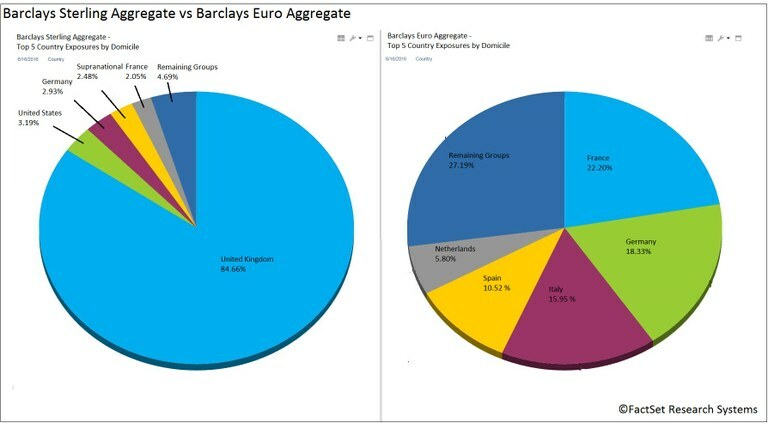 Not surprisingly, the Barclays Sterling Aggregate shows a high percentage of its issues (72.2%) having at least 80% exposure to the UK. However, although the majority of the index has almost complete exposure to the UK, over a quarter of the index has little to no UK exposure. This could make the Sterling Aggregate a better contender for a diversifier than originally expected. Next we look to evaluate these universes as diversifiers under the conditions of a Brexit environment. To capture the cross-asset class correlations and potential diversification, we include equity and create two separate 60/40 blended portfolios, using the FTSE 350 at 60% allocation and the sterling and eurobond benchmarks each at 40%. Results for three out of five shocks exhibit similar performance in both mock portfolios. However, for the exchange rate and yield movement scenarios, we see drastic differences in the efficacy of the fixed income diversifiers. In the exchange rate stress test, the eurobond universe in combination with the UK equity universe helps performance. Conversely, the eurobond universe does poorly at boosting performance relative to the UK bond universe in the yield movement scenario. Diving deeper into these two shocks, we can turn back to our decomposition of the sterling and eurobond markets based on UK revenue exposure. USD/GBP decline shows favor to the fixed income market in general, relative to the equity universe. 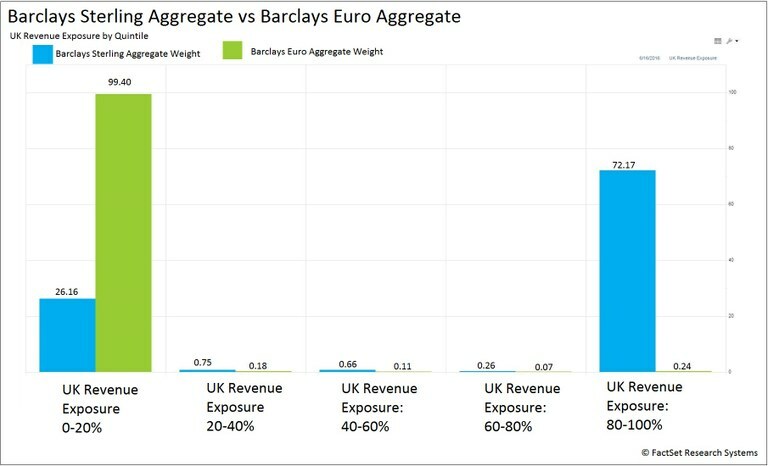 By isolating the performance of a particular exposure group using standalone return, we see the Euro Aggregate showing positive standalone returns for all levels of UK revenue exposure at orders of magnitude larger than those of the Sterling counterpart. For the Sterling Aggregate, the extreme UK exposure groups (i.e. 0-20% and 80-100%) exhibit positive standalone returns compared to the negative returns for the other groups. However, considering the weight of these groups within the respective indices, the lower standalone performance of the issues with 20-80% UK exposure has an insignificant effect. 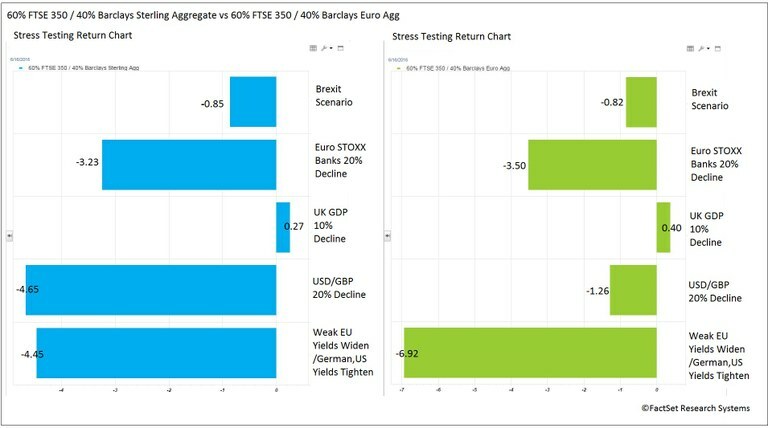 It’s difficult to garner conclusive evidence from this granular view; however, the Euro Aggregate issues evidently perform significantly better and provide an almost fully offsetting hedge for the UK equities in the event of a drastic weakening of the GBP. For the yield movement scenario, the sterling bond universe greatly outperforms eurobond universe. Interestingly, for the former, high UK exposure standalone performance was almost double that of the low UK exposure group (7.43% vs 3.61%). One might conclude that under this scenario, UK domiciled issues with high local revenue exposure are the safest for portfolio allocation. Overall, the stress testing scenarios leave the analysis inconclusive on which bond universes evaluated here provide a better safety net for UK equity exposure, but the positive impact of diversification is clear. Additional analysis can be used to further understand the best potential diversifiers for equity markets. Nonetheless, it’s apparent that as the threat of Brexit looms near, investors need to be looking for ways to cut risk and diversify their equity exposure.